Look what happens to your favorite picot gague when you accidenlty drop it on the floor and the five month old puppy spies it. I heard the CRUNCH and then it was a chase around the room to try tosave it before it was totaly splintered. In the end I had to trade the guage for a doggy treat and you see what I have left. 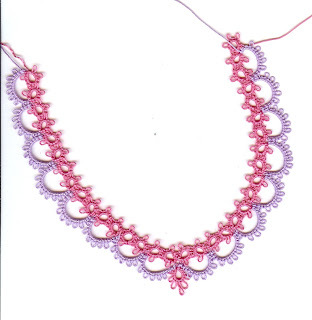 Then on to the tatting projects that have been such a trail all week. Nothing is working out. First I was trying to make Icelas Lacey Heart and totally missed an element and didn't discover it until two rings later. I totally hate to rip out rings! Then I tried Ruth's Easy Heart and put the center ring in backwards again I didn't catch it until two rings later. So I just decided to try it again. This time I at least have the center ring going the right way but it doesn't lay flat so I ripped out the last ring and I am going to add split rings a make it into a necklace for my granddaughter. Maybe I am not suppose to make any tatted hearts. I think I had just better go back to work on the baby booties. I have to make another toe and then the sole and sides of the bootie. I have to quit thinking I have until August to get them made as winter will be over soon and I am going to want to be out doors working on flower and garden beds. In case you haven't seen it on the news the weather in Alaska has been between -46 and -60 this week. I don't think I could manage in that cold weather. My daughter seems to take it all in stride though. She did say you have to prepare for it and be aware of the cold. When they shop they leave the cars running in the parking lots and no one bothers them at all. I am glad her baby will be due in the fall and I won't have to enperience the cold weather. At least not this year. Wow! You can RIP out rings??? LUCKY YOU! I have to unpick them, LOL! You need to share your secret because I would love to know how to "rip" them out it sounds so fast! ;) Yes, I'm being sarcastic; I couldn't resist.